On the edge of the Mojave Desert in California, educators, political leaders, and students face the dangers of bullying after teen suicides devastate two nearby towns. A local middle school counselor initiates an anti-bullying program throughout the district and students take the lead in standing up to hate in their community. This story is part of the Not In Our Town program, Class Actions, that premieres nationwide on PBS stations in February 2012. What began as one educator’s effort to create a safer environment for her middle school campus blossomed into a citywide movement. Massari, a longtime educator, had been thinking of ways to begin an anti-bullying program in her school. Over the summer two years ago, she flipped through channels in a Palo Alto, Calif. hotel room while her son was at Stanford baseball camp. She happened to catch coverage of Palo Alto Unified School District’s Not In Our Schools program on public television. Each year, the district hosts Not In Our School Palo Alto, a month-long event where the school community engages in activities and discussions about addressing hate, bullying and harassment. But for Massari, Palo Alto offered a model. When school started, she launched a Not In Our School campaign with students in her True Leaders program, which focuses on peer instruction. 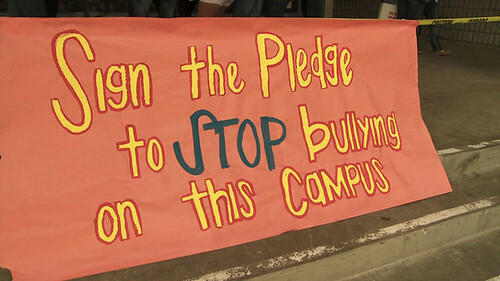 The program began with students leading anti-bullying lessons in middle school classrooms. They also developed the musical dramatization, “Darkness to Light: A Community United Against Bullying,” which highlights the devastating consequences of bullying and calls on all students to play a role in creating safe and inclusive schools. When the True Leaders performed, they received positive feedback and were urged to continue. One city leader, Westside Union School District Superintendent Regina Rossall says, called the program important, moving, and timely. Not long after the performance, the Westside Union School District partnered with the city and its four neighboring districts, Lancaster, Eastside Union, and the Antelope Valley Union High School District. By the time Not In Our Town caught up with Massari in November of 2010, the Not In Our School program had created ripples that touched the entire city. At an Oct. 26, 2010 city council meeting, public officials dedicated the week of Nov. 15-19 to the Not in Our Town Citywide Anti-Bullying program. During the first days of the week, 200 student ambassadors from the four primary and secondary Lancaster school districts conducted anti-bullying activities at their 20 home campuses, comprising 50,000 students. Prior to the program’s implementation, Rossall said many students overlooked how critical bystanders are in perpetuating bullying. The program helped students understand they were condoning bullying by not responding and how they could be part of the solution. The program, Massari admits, is not without its naysayers, who include those who question the boldness of addressing suicide. But for Lancaster, bullying is not something citizens can ignore. In 2008, 15-year-old Jeremiah Lassiter shot himself in a school bathroom in Acton, Calif., and in September 2010, 13-year-old Seth Walsh’s hanging attempt turned fatal after nine days on life support in Tehachapi, Calif., according to news reports. Both towns are within 50 miles of Lancaster. Though not the impetus for the program, Massari says these tragedies resonated in the community. “We’re shocked because it’s just so close to us,” she says. Rossall encouraged Massari to push the program forward, believing the student-centered student-ambassador program focused on anti-bullying could be replicated and interpreted by other schools. For more information on True Leaders, a Not In Our Schools group, visit their group page here. Listen to Lauri Massari talk about how she started Not In Our School in this Class Actions video web extra. Not that it's any of our business, but the other child get suspended also. For fighting or punking your son. I know thats not the point but, I don;t even know why I ask. I hope your son is doing better in school since you take part in the class room. I reay the Principal has a more open mind to the punking going on in his school.